Building a permaculture homestead can be difficult! Setbacks, mis-calculations, unforeseen costs, burn out and bad weather are just a few difficulties that can happen when trying to turn land into a permaculture paradise. 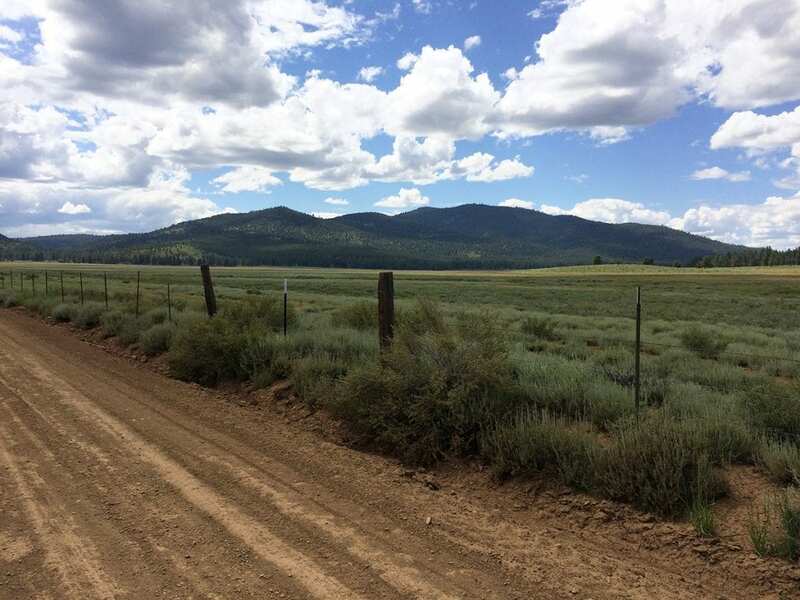 In this guest post, Bret, a homesteader and permaculture practitioner in the Sierra Nevada Mountains shares his experiences from the first year building his homestead from scratch, that will help others get their land development started off on the right track. of Your Dreams so be sure to read the whole post and check it out. All right, take it away Bret. I look at the clock and it’s 1:30 am. Pitter. Patter. Pitter patter pitter pitter patter RUMMMBLE. I jump out of bed and throw on my boots – no time for pants. I find my headlamp and open the camper door and look to the sky. Raindrops fall onto my glasses. I see lightning to the east. It’s not ‘supposed’ to be rainy season here yet, so I have tools strewn about the land for various projects. 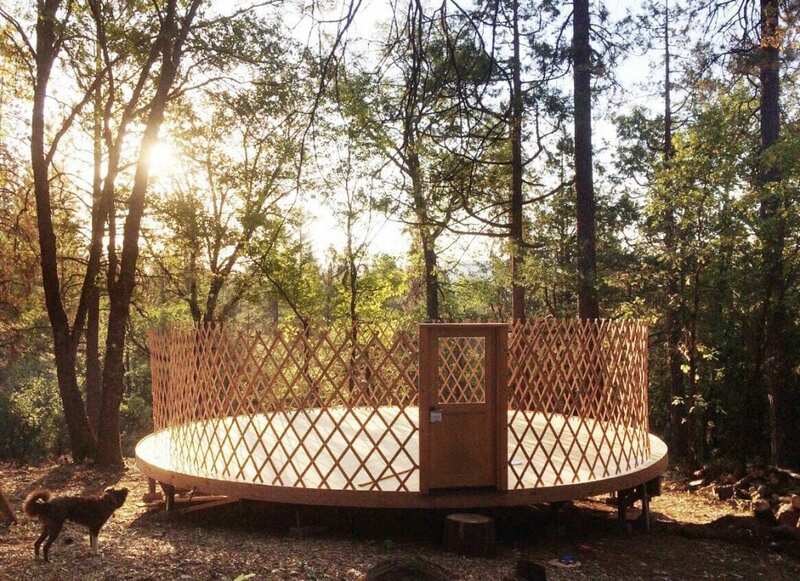 More importantly, there’s a yurt platform with half-done wood floors completely exposed and I don’t have enough tarps to get it covered. I hastily do what I can in my boots and undies and hope for the best. 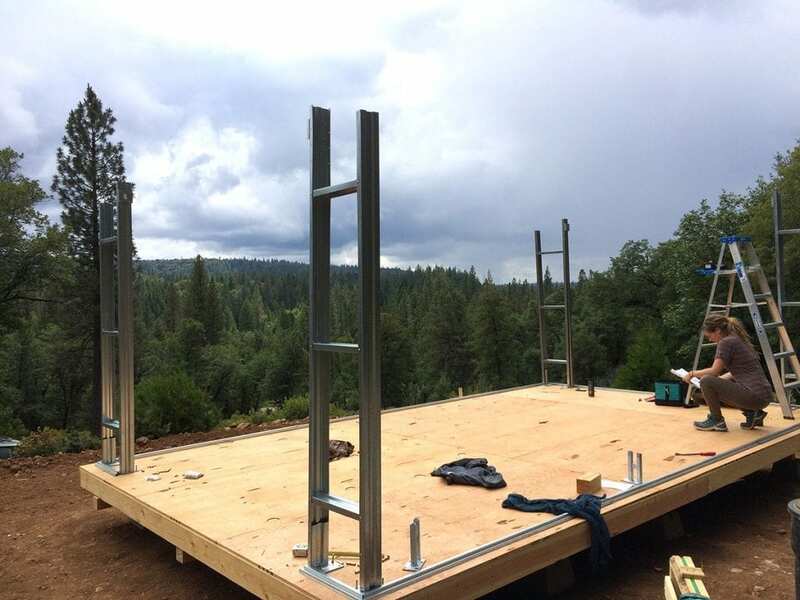 In progress platform for our yurt. When you are developing land, a homestead or farm, these kind of things happen. They are a part of the adventure. They are getting to experience the environment around you to the fullest extent. However, too many events like this can discourage or worse yet, turn back even the most dedicated homesteader or farmer from reaching their goal of turning a property into a functional agriculture dream that they originally had. A year and a half ago my fiancé and I bought 30 acres of raw land. When we shared our permaculture homestead vision with folks all we ever heard was: it’s going to cost more than you think and it’s going to be a lot of hard work. Yes, that was obvious and we were up for the challenge, but it wasn’t exactly helpful advice. It was completely obvious. 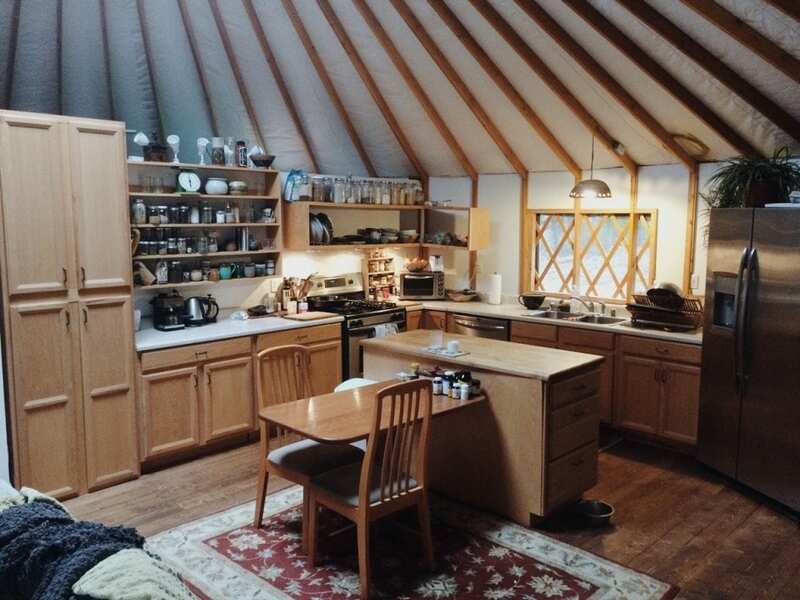 In less than a year and a half we cleared, graded a road, laid a 1/4 mile of power and water lines and built a yurt with a bedroom addition for a fully functioning home. A year later our finished home. We also built and planted a 1/4 acre permaculture garden and small orchard. Most of this work was done by just the two of us, with a little help from our family. While we may have started with raw land, much of what follows will apply to most anyone looking to start or revive a homestead – especially if it’s a fixer-upper or are there are large building projects to add. If you have a timeline for developing your land, building a house, or a large project, be prepared to add an additional 1/3 to your initial time estimations. Then add a bit more. Then another week, just in case. The larger the project the more you should expect to add. You will be surprised how small delays, such as a trip to the hardware store for that one thing will delay progress to move forward, add up. My partner was very diligent in making a schedule, keeping us on track, and adding a buffer of additional time. However, we still went past the finish date on our house by a few months. Heck, we still have a few little projects lingering, but that’s beside the point. 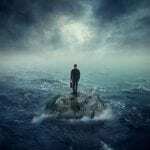 If your project spans a long period of time you must account for burnout. The fault in our schedule was that although we had days ‘off’ from building, they were still filled with life to-do’s, not actual rest. There was still groceries to get, personal life and relationships to tend to, phone calls to make, and a dog to feed. My experience was after working 7 days a week, 10-12 hours most days, by month 9 I was operating at about half my normal speed. Taking a full day at the hot springs or lounging around the house seemed counterproductive, but it actually was very beneficial, and the following days were much more productive. For example, sometimes the tractor broke down requiring hours of work, my chainsaw needed frequent sharpening to clear the trees for the build site, or needing to clean out a gummed up carburetor on the generator all took time away from the task at hand. Those hours add up. Mishaps and errors happen. Sometimes bad. Maybe someone falls through the floor and busted up the insulation you just installed. What about the time you rolled the tractor or the 13th time you got it stuck? 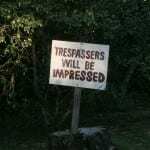 Or perhaps you’re almost done building a tool shed and decide you want it moved 200 yards. Incidents like these can take days to overcome (Yes, those all true stories, by the way). Rain can put a kink in many projects if you’re not properly prepared. Keep in mind that developing land is seasonal. Different times of year dictate what you can do, but always be prepared for mother nature to throw you a curve ball. It’s helpful to plan major building when the season is driest and save detail work for seasons that it’s best to be inside. Also, if you’re in an area where summers are very hot, avoid working during the hottest part of the afternoon. This caused unnecessary wear on me, likely being dehydrated and slowed down my overall production. My advice: get up early, have an afternoon siesta, and then work late. I would think that for many taking on their homestead or farm dreams, tackling projects like building, road development and adding infrastructure may be new experiences. Make sure you have sufficient time to learn new skills before diving in too deep, or you may end up needing time for re-dos or errors. Building and developing a farm or homestead is expensive. Period. My partner is exceptionally good with money. She can find the best price in town, is skilled at finding second-hand deals and keeps a tight budget. Even still, we were about 15% shy of our cost estimates and sometimes a bit more on particular projects. There is always some small thing needed that didn’t get budgeted – and those add up. Despite our impressive collection of tools we had to rent and buy more. Lumber cost more than expected. We needed more this and a lot more of that. Each time, I could hear the cash register *ching* and chip away at our funds. I was glad we had additional funds allocated as a buffer. And don’t forget the unexpected expenses. You may own a tractor, but it doesn’t matter if you have a deadline, it can break. Six feet before finishing my 100’ trench, my backhoe broke. With the county inspector due the next day, I had no choice but to rent an excavator to finish the last 6’ of trench! Not only did I have to pay for the rental but I had to order and pay for a part on my backhoe to get it up and running. That was a $350 unexpected expense we didn’t see coming. Similar to time, always add about 1/3 to your budget. Then add some more. You’re getting the drill I think. A good stockpile of tools is absolutely necessary when developing a homestead. Woodworking, welding, power tools, hand tools, ladders, you name it – we used it and then some. Piles of tarps are invaluable. You never know when you need to cover up a large wood floor, or other piles of lumber. Also, walkie-talkies come in handy more often than you’d think if you have a large parcel. Both for relaying questions/message but also for safety if you’re operating dangerous equipment. Once I got a concussion from a T-post pounder and was almost too disoriented to find my way home. For the sake of your wallet and the environment, keep in mind that you don’t have to buy everything new. Yard sales, flea markets and Craigslist are great places to score some used tools. Some towns even have used tool stores. Check them out on occasion as they tend to get different tools at different times. 1. Hands down our little orange tractor. It was a pricy upfront investment but has paid for itself tenfold as an asset that is used almost every single day. 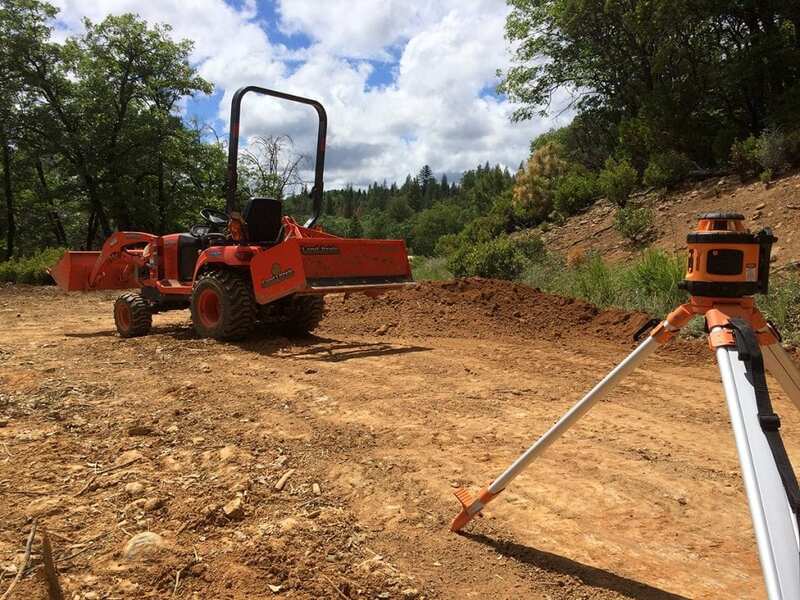 Clearing access roads, moving piles, digging trenches, earthworks, lifting heavy items – the small but mighty Kubota bx25 loader backhoe expedited progress and save a lot of backaches. If you purchase any one add on for a tractor, bucket forks (aka pallet forks) have been incredibly useful for things you wouldn’t even imagine. 2. Chainsaw. Not some small electric chainsaw – a beefy one with a long bar and horsepower. We started off with a smaller gas saw and struggled with it for basic tasks like clearing. Once we upgraded to a mid-size chainsaw forest management on the homestead became much easier. Please don’t forget the safety gear, your well being is worth it, you can use a chainsaw with one arm after all. 3. Portable tool set – drill, impact driver, circular saw, etc and additional batteries. These tools saw a lot of use in all of our building projects, especially in locations that did not have power. We even had two drills and impact drivers because there would often be a few people trying to complete a task and it made the work go much faster. Our camper had a solar panel with a power inverter to charge batteries before our power system was up and running. Farming and homesteading is hard work. Developing a farm or homestead is even harder work! Here are a few tips I found to be vital for my mind, body and soul during this intense building time. Find time for self-care. Don’t wait until you are hurt or in pain to tend to your needs. Our bodies need time to rest and heal. My favorite go-to’s were massages and soaking in hot springs. 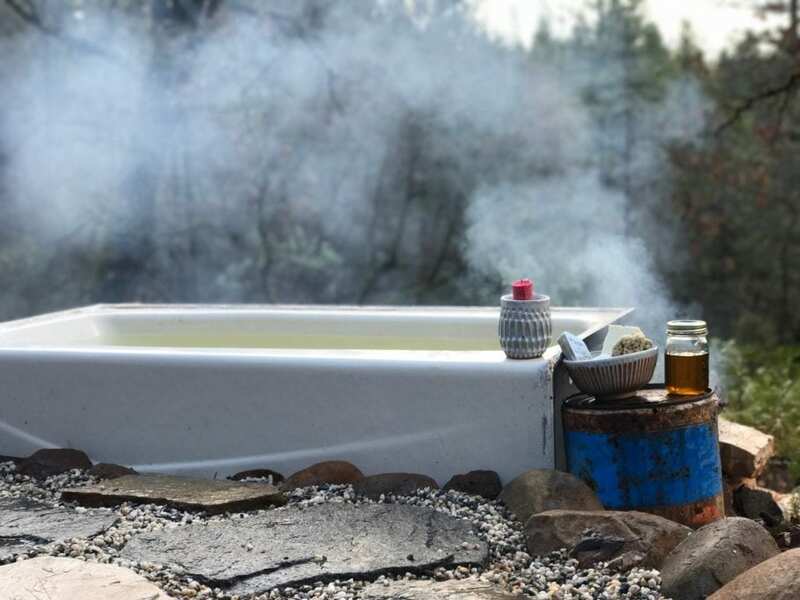 Before we had plumbed hot water I built a poor man’s wood-fired bathtub overlooking our creek and we used it most cool nights. Do not skip on good work boots. One step better – get extra comfy insoles. I saw a huge difference in my fatigue level when I didn’t have proper footwear. Do not lift with your back. Bend at the knees and lift. I threw my back out picking up a single piece of firewood because I wasn’t moving in a body-conscious way. It caused me to lose consciousness and use a cane for a week. Two years later I am still healing. Tend to your relationships and family. Building a homestead can put a strain on even the strongest of relationships. Exhaustion from physical labor, money decisions and differences of opinion will arise so navigating conversations with consciousness and love will go a long way. Make friends with your neighbors. They can be a huge asset in lending a hand, a tool or moral support. Not to mention great company and community. It’s fun to repay the favor by helping them on projects or sharing gifts from your homestead. Have an emergency plan. If you are in an area with limited phone or internet, as we are, know how to get ahold of emergency services. Crockpot meals are your friend. The last thing I ever wanted to do after building all day was to cook a meal when I was hungry and tired, so we prepped everything in the AM and it was ready for dinner. Big bonus points – use a solar oven! Remember this adage: you can have it FAST, GOOD, or CHEAP – pick any two. Some projects will be cheap and fast, others will be slow but done well. Keep this understanding in mind and apply as needed. Also, be flexible and maintain a sense of humor. Beyond all of the notes I have shared with all you eager permies, farmers and homesteaders – one of the biggest take aways I learned in this process is that through many of the bumps and hiccups along the way, chances are it will all be okay. At first, we were very disappointed the rain on yurt floor had warped the boards and caused gaps. Additionally, when it came time for stain, I rushed through and did a terrible job. It felt like a major buzzkill at the beginning of all our building projects and for weeks it bummed me out. But you know the funny part? Once we finished the building and moved in, the first thing 9 our of 10 people comment on is how lovely our rustic wood floor looks. We laugh to ourselves, knowing that mishap was a just drop in the bucket and a small testament in just how far we’ve come. Best of luck on your land development endeavors. It may not be for the faint of heart, but it’s one of the most rewarding projects I’ve ever experienced. Check out the FREE ebook – Finding Land for the Permaculture Homestead or Farm! One more thing, William promised that I’ll be giving away my free ebook so here it is. 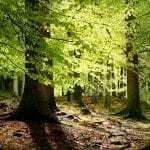 I want you to purchase the RIGHT piece of land the first time and avoid costly mistakes, lost time, and hardships developing your permaculture paradise. By carefully evaluating land, through the lens of permaculture, you can be confident that you are choosing the best property for your goals. This ebook will immediately get you on track to finding the right piece of land for your permaculture homestead or farm. Bio: Bret is a homesteader and permaculture practitioner in the Sierra Nevada Mountains with his family. 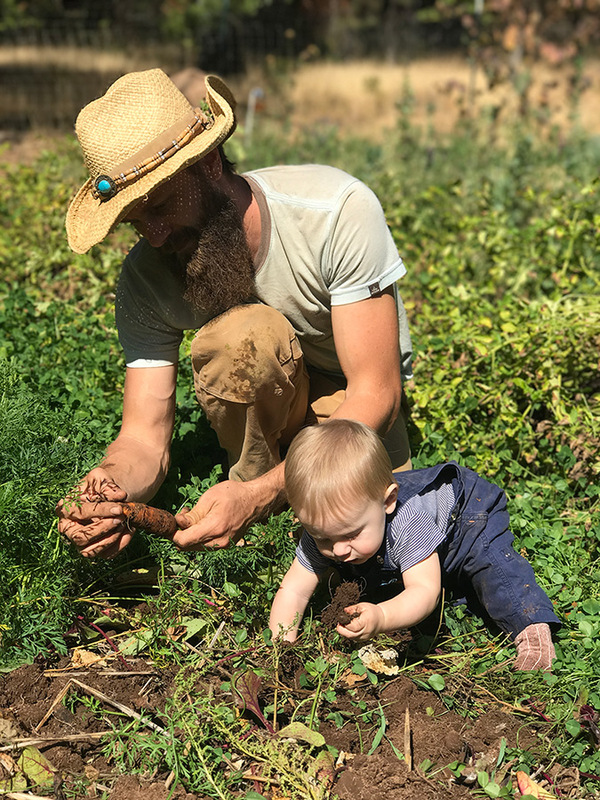 Years ago they left the city and their 9-5 jobs to buy raw land and are developing a regenerative homestead, learning and improving their skillset as they go. Bret and his family are passionate about inspiring and helping others feel empowered to take on their own permaculture homestead.